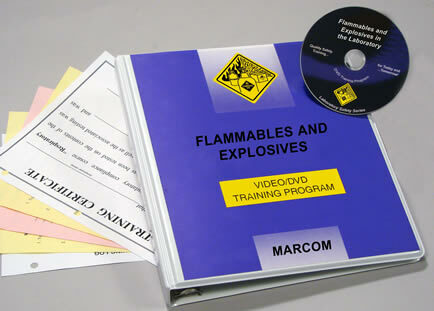 Description: MARCOM's "Flammables and Explosives in the Laboratory" Videotape Training Program discusses the nature of flammable and explosive materials, as well as hazards associated with their use. It also reviews the proper handling procedures and personal protective equipment that should be used when working with these substances. Flammables and explosives are some of the most dangerous materials used in a laboratory. When working with these substances, employees need to know their characteristics, as well as how to prevent accidents and injuries when using them. Areas covered in the program include definitions of flammables and explosives, conditions that can create hazards, the role of ventilation in preventing problems, transporting flammables and explosives, storage considerations, using compressed gases, emergency planning, disposal, and more. The Videotape Program comes with a comprehensive Leader's Guide, reproducible Scheduling & Attendance Form, Employee Quiz, Training Certificate and Training Log. This Videotape Training Program is one of 12 in the “Elements of Safety” Laboratory Safety Training Series.